February 1, 2019 by Destini Copp	in tutorials. Want to know the secret to quickly grow your email list? People love taking quizzes. Even my mom. All my friends. And your ideal customer. Why quizzes? Quizzes tell people a little about themselves and give them insight into what direction they need to go. They’re fun and engaging. You get the idea. You can create an engaging quiz for about any industry or market. Tip #1: Ensure that your quiz aligns with the service or product you’re offering. For instance, going back to my example of my friend who is a PR expert and works with influencers, if her quiz was related to “what kind of influencer are you?”, then this is directly related to her service offerings. She can provide huge value to the quiz taker by guiding them through how they can determine their influencer niche. If you’re having trouble with this, think about the question you get asked ALL the time. For instance, I help course creators create and market their online courses. Two questions that my audience asks about are 1) Which online course platform should I use to host my course? and 2) Which price is right for my online course? Both of these would make great quizzes! There are personality quizzes like “Discover your Shoe Personality!” There aren’t any right or wrong answers here and the point of the quiz is to help the quiz taker understand a little more about themselves. This article has some great information on how to develop a personality quiz, but my main tip for you is that when you create a personality quiz, you develop the answers first. 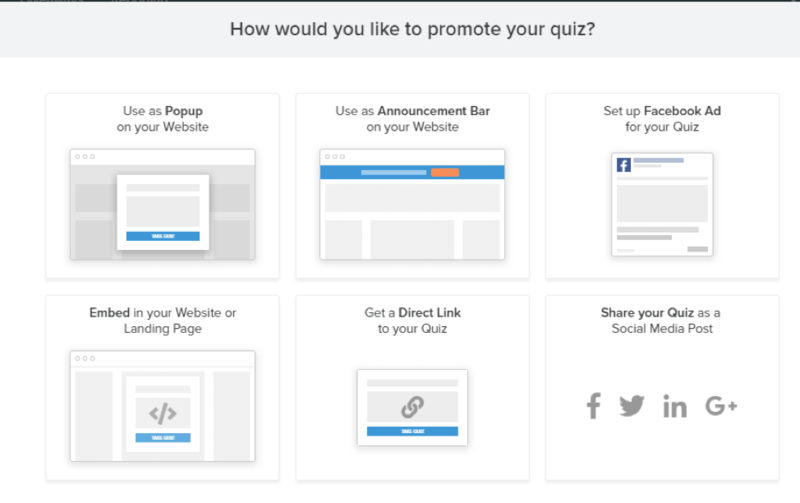 Just like your email subject lines, you need to entice your visitors to click on your quiz. 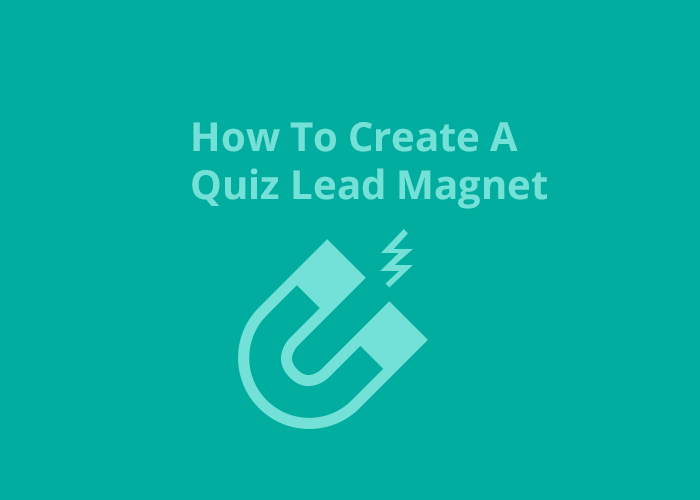 If your readers don’t get intrigued by your quiz topic, they won’t click on the button to take it. You want this to be a fun quiz and one that they finish. Don’t make it too long; usually 5-7 questions are enough. Just remember that long quizzes feel more like taking a survey and they will quit right in the middle if they get bored. A tip is to use images as answers to your questions or on the question. Images are very engaging and keep their attention. 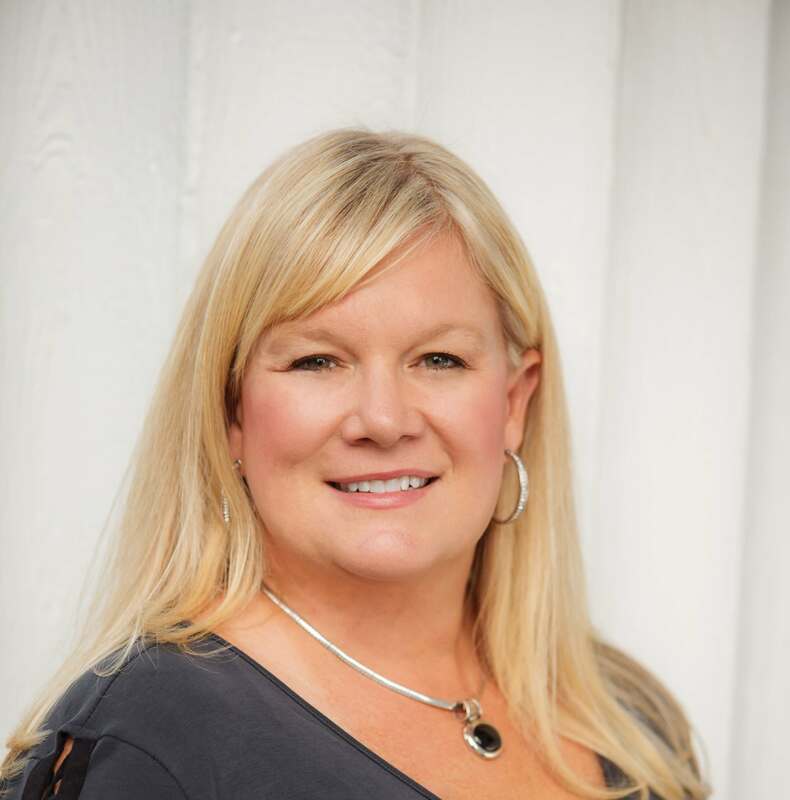 If you’re stuck on what questions to ask, check out this blog post. 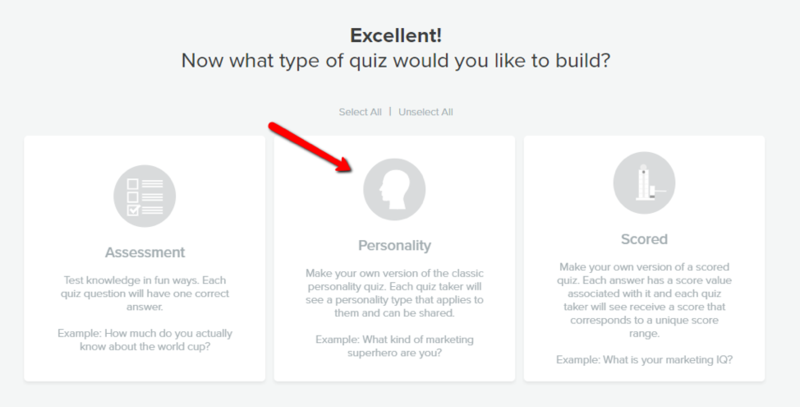 You can also use the quiz results to segment your list. Let’s assume that you have a quiz that assesses “Where you are on the blogging roadmap?” Depending upon their answers, you can segment your list into a blogger who’s just starting out, one that’s been blogging for a while, but doesn’t know how to monetize their blog, or someone who’s an experienced blogger and ready to take the next step in her entrepreneurial journey. This allows you to send out targeted information, so you can best serve your audience. 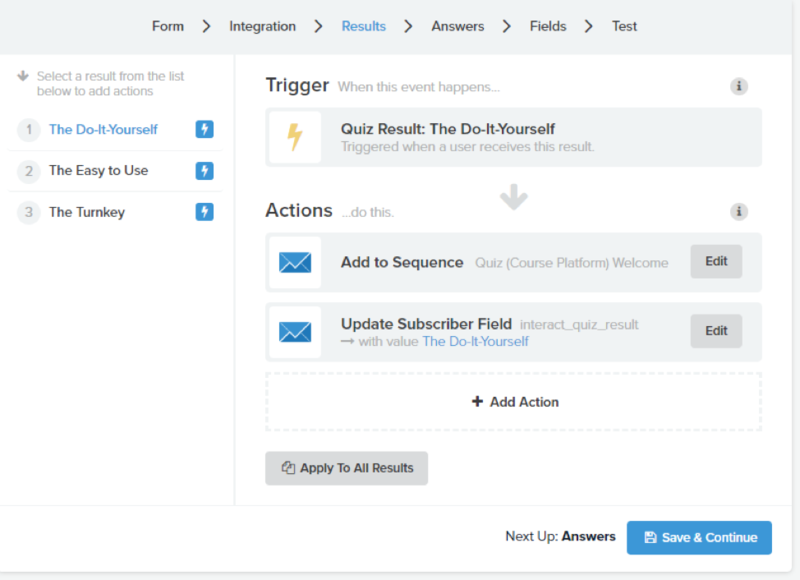 I want to show you how to create a quiz using Interact. 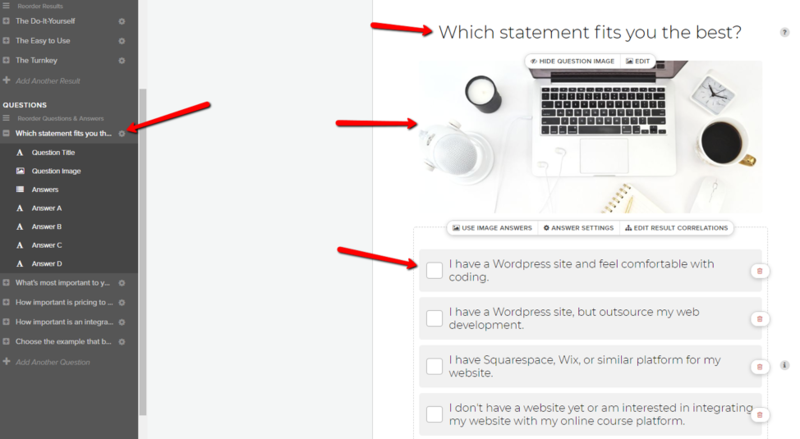 In this example, I’m going to walk you through how I created one of the quizzes for my website. 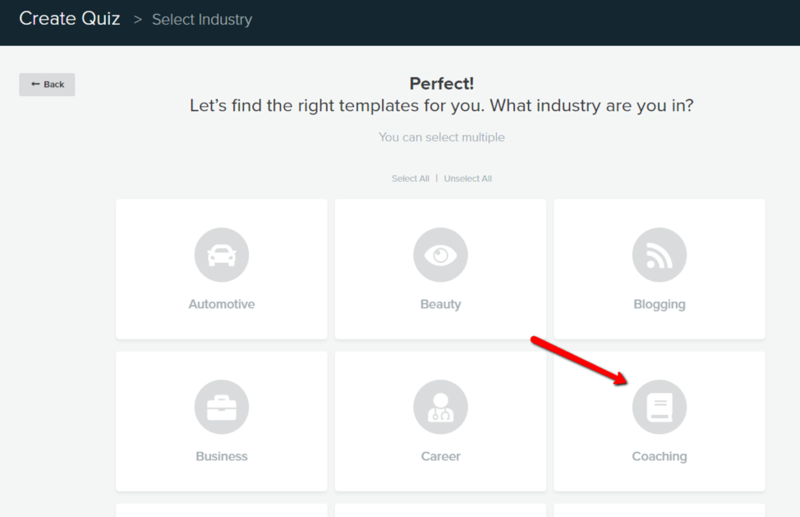 It’s located in the announcement bar at the top of my site: Want to find out what online course platform is right for you? Click here to take the quiz! As I mentioned this is one of the MAIN questions I am asked, and this quiz walks them through what kind of course platform they should review based on their own personal preferences. To create your quiz, using the Interact app, click on Create New Quiz. Then you’ll be asked, do you want to start from scratch or use a template. I highly recommend using one of their templates, so you have some examples to follow! 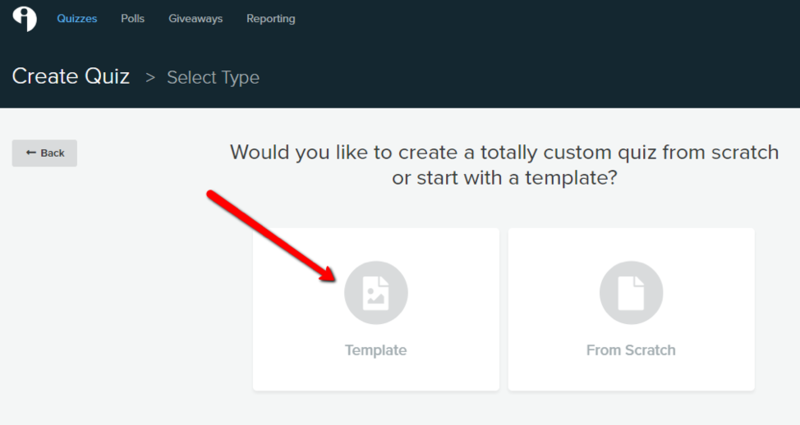 Also, the templates are designed to convert and you’re able to edit the content as needed for your personal business. Next, you’ll select your industry and you can select more than one! In the next step, you’ll be asked what type of quiz do you want to build? You can select from Assessment, Personality or Scored. I would review all the options to understand which type of quiz would be best for your business. Now it’s time to select your template. Take a few minutes, review various templates and think about your audience and what they need help with. 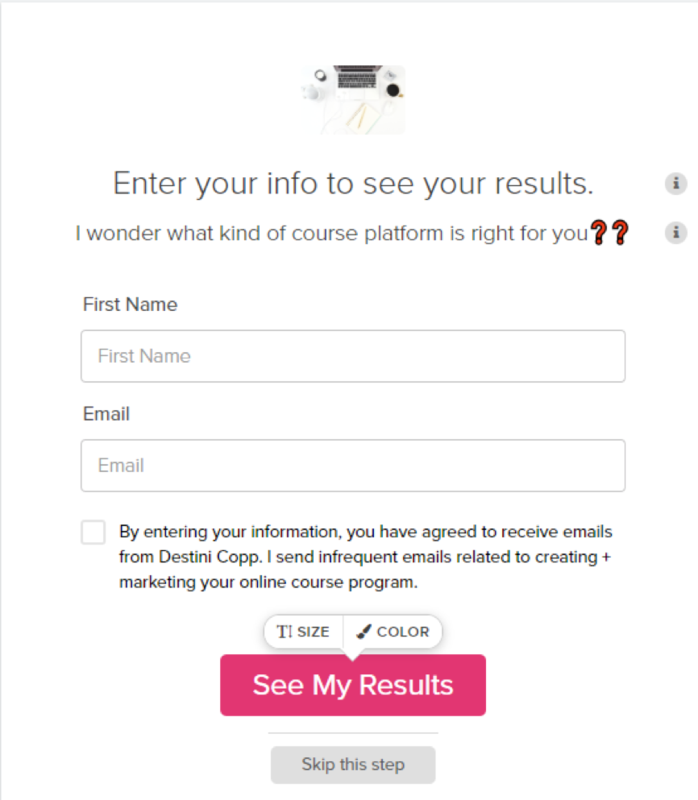 I used the template “What Kind of Content Creator Are You?” as a basis for my quiz, “Want to find out what online course platform is right for you?” After reviewing several templates, this one was most aligned with my quiz goals. Once you have selected your template, you will want to begin with branding. I changed the font and the brand colors (to match my own branding) for my quiz. To do this, go to Style and input the hex codes for your brand colors. Now you need to edit the cover page for your quiz. Just go to Content, then Cover. You will need to edit your quiz title, your cover image (make sure it’s on brand), your quiz description and your button text. In this example, we are editing a personality quiz. Here, you will edit the title of your personality, the image, the description and the call to action. On the call to action, you can choose to hide it or to direct the subscriber to a URL. In my example, you can see my do-it-yourself personality. I edited the name of the personality, the picture which is related to the personality, and the description of the personality. Next, it’s time to edit the questions and create the correlations with each personality. Some key points to remember. You can use image answers instead of text. Also, don’t forget to edit the results correlations. This is the result the subscriber will receive after inputting all their answers for each question in the quiz. This next step is made easy by the integrations by Interact. Where it says “off” below, click on it to say yes. Set up your opt-in form. I only required first name and email address which is what I typically include on my opt-in forms. 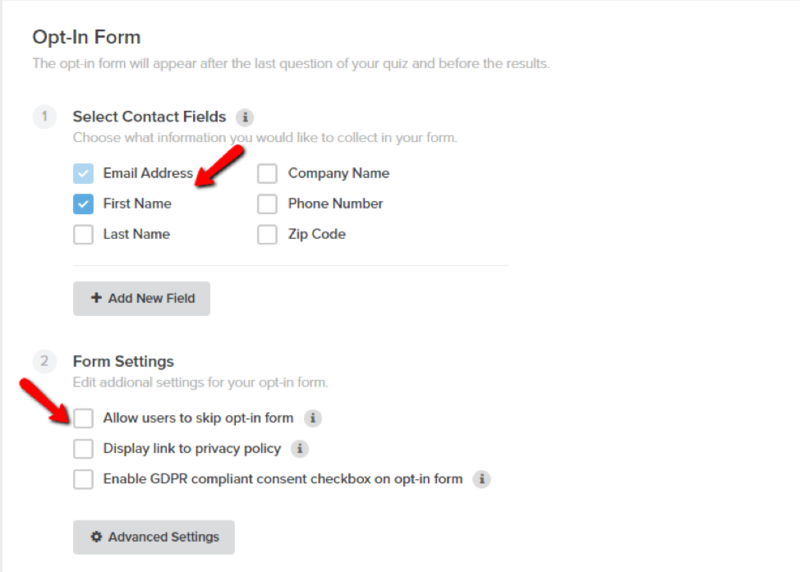 They provide the option to enable a GDPR compliant consent checkbox on the opt-in form which you can see that I’ve enabled below. You can also modify the information for your opt-in form. For example, as you can see below, I have informed them that if they input their information, they have agreed to receive emails from me. 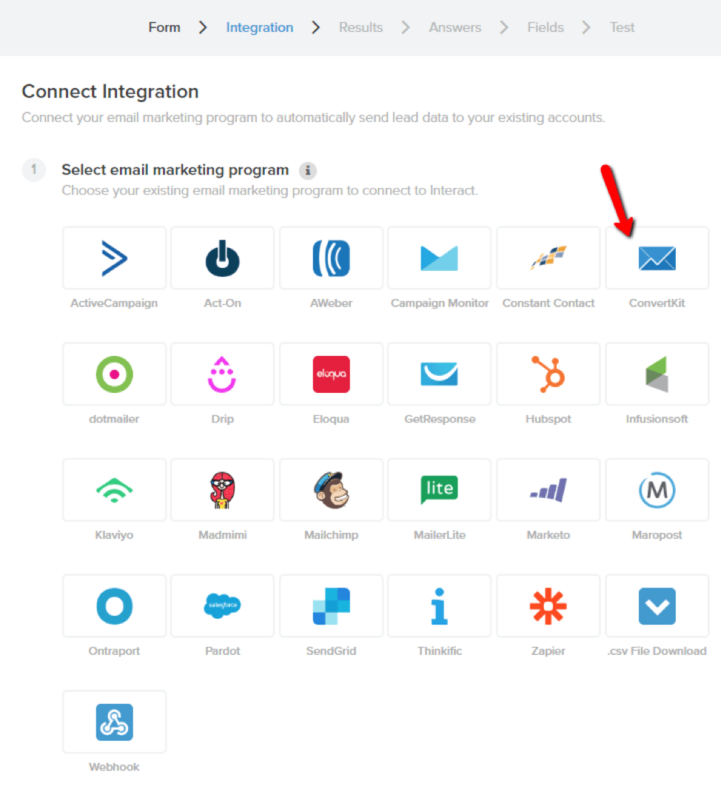 It’s now time to select your email service provider so you can automatically send lead data from Interact to your list. I have ConvertKit, so I’ve selected them for integration. Once you integrate your email service provider, the next step is to finish the integration. I elected to add them to my list with a tag (the outcome they received on the quiz) and then add them to an email welcome sequence. Once you go through all the steps, it’s time to test your integration. Make sure everything is working and if you run into issues, contact Interact’s help desk. 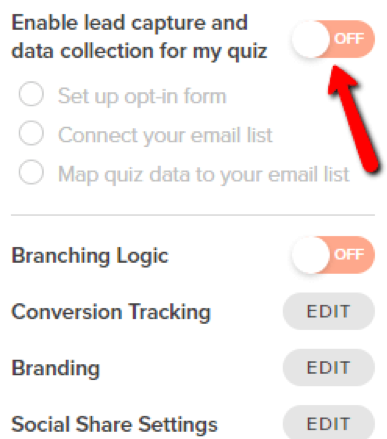 Now it’s time to publish your changes and promote your quiz. You have several options here, including publishing as a pop up on your website, an announcement bar, embedding on your website, sharing in a social media post, or getting a direct link to your quiz. I put it on my website announcement bar and also embedded it on my website for social media promotion. Once my quiz was live, I started promoting it everywhere. Quizzes are great to have as the call to action on a social media account (see the call to action on my Pinterest account below). What about you? 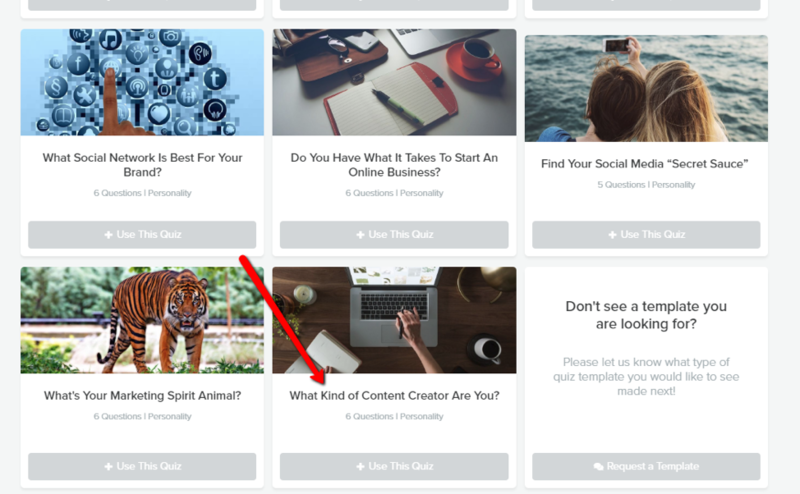 What type of quiz do you want to create to help you grow your email list?